The company will charge you $20 if you transfer the domain name before the first year renewal. .Com domain names for a dollar! 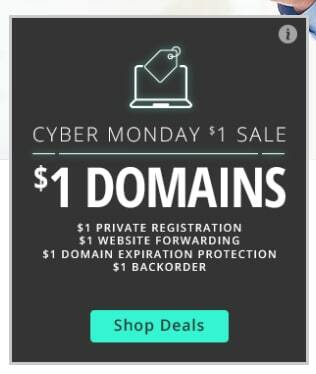 That seems like a pretty good deal, even if Network Solutions’ Cyber Monday special is limited to one domain name. But if you read the fine print sent in an email to customers today, you’ll find that this is a horrible deal. *$1 promotional pricing applies to the first year and is valid for 1 new purchase only. Domains transferred out prior to the first renewal will incur a $20 service fee per domain. Services will automatically renew until cancellation or until auto-renew is turned off within Account Manager. After one year the services purchased will renew at then pricing. Domain and Backorder offers are only valid for the following extensions: .com, .net, .org, .info or .biz (.co also available or an additional fee for domain registration only). Offer does not apply to premium domain names or renewals. DEP and Private Registration are only available for certain domain extensions; please see the product pages for more details. Domain names are registered on a first come, first served basis. No guarantees that domain name will be available or accepted by registry. Offer cannot be combined with any other offer, service upgrade or free trial. Please see our Services Agreement and any applicable supplemental service agreements for additional terms and conditions. Offer is valid only on November 27, 2017. Did you catch that second sentence? If you don’t renew your domain at Network Solutions and decide to transfer it elsewhere, you have to pay $20! That’s some very fine print. Crafty and deceptive registrar who add a bunch of services you dont need and think its a good deal.Been moving my domains in batches away from them before it expires as they keep delaying instead of sending you your instant auth. codes when you click to have it sent.Only reason my names end up there is if backordered and it ends up there. Shame on them with their offers with no added advantage. 100% concur with your comments. I got so P’d off with Network Solutions once delaying sending me an Auth Code that I reported them to ICANN and then they moved quickly. So if you get problems with them then report them to ICANN. Definately one Registrar NEVER to use. Good eye! But who among us is still doing business with Network Solutions? I know I learned the hard way. I also went to their site and went thru the process of getting that “promo” and I could not find the fine print about the transfer out fee. I’m sure a couple of folks took advantage of this registration price but are going to be a little surprised come net year. To be honest, it’s a shame that Netsol would resort to this type of tactic. I didn’t see the fine print on the web site at all the first time through. Went back to the beginning of the process to find that i symbol. I just love your posts! Keep it up! The world needs more good guys, like you! Seems like they are resorting to similar tactics in the past used by some of the mobile carriers—essentially a switching or early departure fee. First time I’m aware of this going on the domain name business. Sad and concerning to see this kind of thing going on. Does not help or improve the image of the industry. Many years ago it was a great company with a lot of talent—mostly if not all departed now. I’ve moved all of my names (and that of some customers) away from them over the years. I only have one name with them right now just to remain a customer so I can keep up with their customer marketing, messaging, sneaky stuff as you mention, and be able to inform and guide my customers.